This is some thing new. According to Scientists at Queen’s University, humans could be used to provide high speed wireless Internet through the use of wearable sensors! This is part of a new science called “science of body centric communications” which is seeing major progress lately and scientists claim that this technology will have a variety of benefits, from medicine to gaming. Researchers have been developing small sensors that have the ability to work together to create body to body networks (BBNs). Dr. Simon Cotton of the Wireless communications research group said that by 2014 the technology is expected to grow more than 400 million devices. Dr. Cotton stresses that the benefits are end less from mobile gaming, real time training in sports and even precision monitoring of individual athletes. 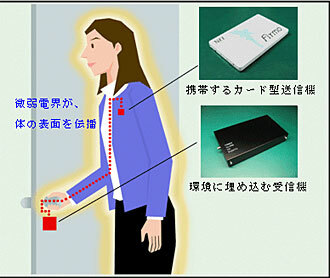 The wireless body sensors would eliminate the need for cell phone towers which means better environment at less power. Whatever it may be its a great way for the governments to keep an eye on you and track you. Humans can Back Up their Brains by year 2030! Weird? A Wireless Sound Hat!